I cannot deny myself the pleasure of replying to your kind letter of the 14th. Such generous appreciation of my work by those whose favourable judgment I most desire to win heartens me more than I can say. 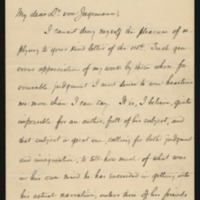 It is, I believe, quite impossible for an author, full of his subject, and that subject a great one, calling for both judgment and imagination, to tell how much of what was in his own mind he has succeeded in getting into his actual narrative, unless those of his friends who are trained to appreciation give him their verdict on the subject. You may judge, therefore, how greatly it cheers me to be told by men like yourself that I have succeeded. I thank you most sincerely. It was a real pleasure to hear from you, and I hope you will let me send, not only to yourself, but also to Mrs. von Jagemann, the warmest regards, in which Mrs. Wilson heartily joins. Wilson, Woodrow, 1856-1924, “Woodrow Wilson to Hans CG Von Jagemann,” 1897 January 25, WWP20446, University of Virginia Woodrow Wilson Letters, Woodrow Wilson Presidential Library & Museum, Staunton, Virginia.